How many calories in Blackcurrants? See below, the Blackcurrant calories for the different serving sizes. 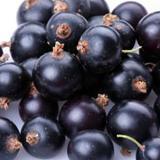 We provide you with the Blackcurrant nutrition facts and the health benefits of Blackcurrants to help you to lose weight and eat a healthy diet. Blackcurrants are a rich source of potassium which have almost as much potassium as bananas, an excellent source of vitamin C – four times the vitamin C of Oranges and they have twice the amount of antioxidants as Blueberries. In addition, Blackcurrants contain phytonutrients, vitamins, minerals and essential fatty acids, including Gamma-Linolenic Acid (GLA) or omega-6 essential fatty acid that is rarely found in any other natural resource and cannot be produced by our body on its own. Blackcurrant benefits are thought to include acting as an anti-inflammatory, helping to reduce the effects of arthritis, and potentially reducing the risk of cancer. See our fruit calories comparison chart to compare the calories in Blackcurrants with the other calories in fruit to help you to build your diet plan. Want to know more about this fruit along with other currants? Then take a look in more detail at currant nutrition. Finally if you want to compare blackberries to the nutrition of other fruits, then read our fruit nutrition facts. All of our calorie and nutrition information is sourced from the US Department of Agriculture.